Fast automated ultrasonic inspections can be performed at 8 bit data sampling frequencies of 500 MHz with data transfer rates of 20 Mbyte/sec. These rates can be achieved with a dedicated PCI-ADC card installed in a standard PC. This paper presents the above mentioned system together with dedicated UT probes for tube inspection. 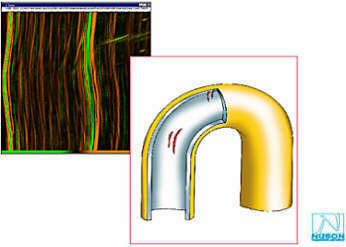 Detection of small circumferential cracks in 7/8"(22 mm OD) tubing in an area with tube wear. Detection of small axial cracks in the small radius U bend region of 7/8" (22 mm OD) tubing. Crack measurements in 10 mm tubing. Fast data acquisition and high sampling frequencies are needed to meet accurate flaw size detection and inspection speed requirements. The Nerason 1090 measurement system is an automated, fast, data acquisition and analysis system for ultrasonic tube measurements. The Probes, (Local) Control Unit, Mechanical Parts and Auxiliaries are designed for tube examinations. The Acquisition Station can be used for all kinds of repetitive data acquisition tasks. This paper gives an overview of the system performances when used for advanced ultrasonic tube inspections. The auxiliary equipment is needed for driving the probe through the tube and supplying the coupling liquid, normally water, to the probe. The Local Control Unit, which can be placed at a distance of 150 m from the aquisition station consist of several control and power units to enable the remote control of the measurements. The Nerason 1090 data acquisition system consists of a standard high level PC equipped with an Analog-Digital Converter card (ADC card) connected to the internal PCI-bus. All software modules are designed to give the user total freedom in configuration, data acquisition, data processing, screen lay out design and hardware components usage. The Nerason data acquisition card is responsible for the high speed data acquisition of the (repetitive) measurement signal. Connected to the standard PCI bus which is available on standard PC's the signal is digitized, temporarily stored, pre-processed and transferred to the bus. Design is in a way that the limitations set by the system are better than the physical limitations set by the ultrasound response. In many applications the system is faster as the ultrasound asks. 2.5 Analysis Station and Data Storage Unit. The Analysis Station and Data Storage Unit, which can be physically the same unit as the Acquisition station, consist primarely of dedicated software to analyse the data and a clever storage medium. Fig 1.3: 12 mm Wall thickness probe Fig 1.4: Wall thickness measurement technique. 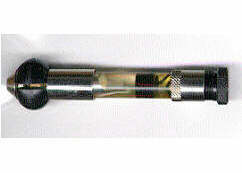 For general wastage measurements, a 12mm window probe is used with a 45 degree mirror. The probe will be immersed in water to allow the ultrasound to propagate easily. A transducer emits an ultrasonic pulse, which will be reflected by a rotating mirror. 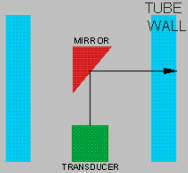 Reflections from the water steel interface and the back wall of the tube are received by the same transducer. By measuring the time of flight between these reflections the wall thickness can be measured. Many kinds of data presentations are possible to show the results. Figure 1.5 shows an example of 3 dimensional data presentation of a test tube with flat bottom holes. Wall thickness can be measured with an accuracy of 0.02 mm. 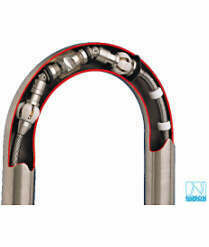 3.2 Detection of small circumferential cracks in 7/8"(22 mm OD) tubing in an area with tube wear. Tube wear can occur for example at the support plate location in a steam generator. The remaining wall thickness can be measured and cracks can be detected and sized in such an area. Figure 1.6 shows a drawing of such a location with a data presentation of the wall thickness measurement. 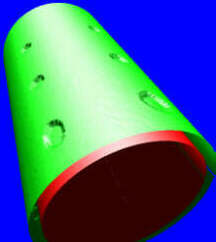 The so called "C scan" plot shows green as the nominal wall thickness and red as a thinner wall thickness. Figure 1.7 shows a data presentation of a crack found at such a location. 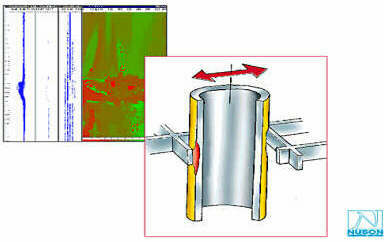 The depth and length of the crack is automatically determined by the analysis software. 3.3 Detection of small axial cracks in the small radius U bend region of 7/8" (22 mm OD) tubing. Special probes ( see figure 1.8) are designed for detection of cracks in tight radius U-bends. Figure 1.9 shows the most likely location of cracks to occur and a so called "Bscan" presentation of the defect area. This type of defects request a high level UT analysist to evaluate the data. This way of analysis enables 10-20% trhuwall cracks to be detected and sized. 3.4. Crack measurements in 10mm tubing. Figure 1.10 shows a probe specially designed for very small tubing of 10 mm ID. Cracks of 15% Thruwall can be detected and sized in very small 10 mm ID tubing. The advantage of the above system is the possibility of obtaining all necessary data with limitations now set by the physics of the ultrasound and not set by the acquisition speed of the system. Figure 1.11 shows a graph of the inspection speed for detection of 20% thruwall cracks in 20 mm tubing througout the years (one channel system). The red line shows the physical limit which is set by the time the ultrasound needs to travel through the material.